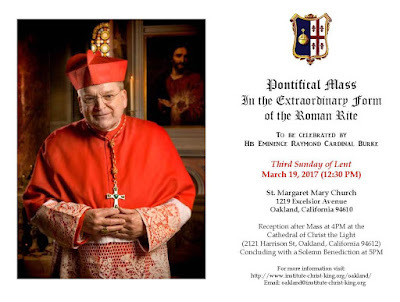 His Eminence Raymond Cardinal Burke will celebrate a Pontifical High Mass on March 19, the Third Sunday of Lent, at the church of St Margaret Mary in Oakland, California, beginning at 12:30 pm. The church is located at 1219 Excelsior Avenue. The Mass will be followed by a reception at the cathedral of Christ the Light, (2121 Harrison St.), with Solemn Benediction afterwards.